Asukayama Park (飛鳥山公園) is a very popular Sakura spot in Tokyo. It has also great Hydrangea located on the north side of the park. 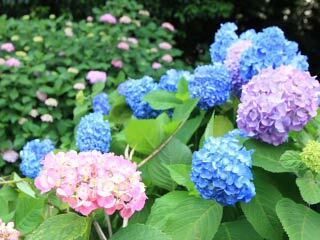 There are 1,300 Hydrangea trees which are one of the biggest numbers in Tokyo Metro area. They are planted on the north side of the park between train rails and the park. 1. use KeihinTohoku Line to Oji.